This script creates a graphical DVD menu with background music. It is written in PHP. This is your main code. It configures the script. Save it as, for example, make-menu.php. $g_height = 576; // Use 720x576 for PAL, 720x480 for NTSC. /* A ttf file containing the font for the menu. * Up to you to ensure it exists in your system. 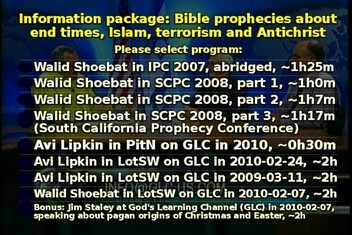 6 => "Bonus: Jim Staley at God's Learning Channel (GLC)\n". "in 2010-02-07, speaking about pagan origins\n". "of Christmas and Easter, ~2h"
* script will be complete and ready to be used. 'parts/parta4.mpg',  // the particular program. 'parts/parta7.mpg')),// begins a new chapter though). // Temporary files used by the script. You can ignore this section. Note that you also need the common code file, below. On the right, you can see the result of this example menu (sans the cursor, which is a filled yellow circle).
" <video format=\"$format\" aspect=\"$g_aspect\" />\n". print     "     <vob file=\"".htmlspecialchars($g_output_menu). "\" pause=\"inf\" />\n".
" <pre> jump vmgm menu entry title; </pre>\n". print "    <post> call vmgm menu 1;</post>\n".
" -vcodec mpeg2video -qscale 1 -g 600 -threads 4". "mplex -V -f 8 -o /dev/stdout /dev/stdin ".escapeshellarg($g_background_music). * guess is to be used. Given given given. || $box['height'] > $height) // Too large? && $box['height'] < $height) // Could be larger? // for sure the text is completely in the image! SETS="-flags +mv0+umv+qprd -cmp rd -subcmp rd -mbcmp rd -mbd rd -trellis 2 -directpred 3 -partitions +parti4x4+parti8x8+partp4x4+partp8x8+partb8x8 -me_method epzs -dia_size 4 -pre_dia_size 2 -subq 10 -qcomp 0.1 -bt 260000 -nr 2 -bf 2 -b_strategy 2"
It is a shell script that issues multiple jobs in parallel (multitasking / scheduling), while maintaining a limit of $MAXPROC simultaneous processes. Note that this encoding script is a tad slow. It is optimized for creating a small file for fitting a lot of content on a DVD (more than 10 hours in this example case of mine). You can and should increase the vb and ab values to create better quality videos. Both standards support the 4:3 and 16:9 aspect ratios. However, the 16:9 aspect ratio ("widescreen") is only available for video that is 720 pixels wide. http://en.wikipedia.org/wiki/DVD-Video — DVD-Video at Wikipedia. http://www.michaeldvd.com.au/articles/palvsntsc/palvsntsc.asp — PAL vs NTSC. http://nfs.shawnfumo.com/wiki/DVDAuthor/XML — DVDAuthor XML file format. http://vdrsync.vdr-portal.de/dvdmenus/ — dvd-menu.pl, but the author of VDRsync, is the script that was reference material for creating this proram. Want a copy of the software described on this page? Just copy&paste it and it is yours!